WMS: Interested in High School Cheer Tryouts? See the flyer. Ms. LoCicero, Mr. Schoepp, and WMS students put 12 yards of soil and 40 yards of mulch to good use in the garden yesterday! Drive by Foothill Dr to check it out. A big thank you to WUSD employee, David, for all his help! Please see the information for the Town of Windsor Sports Night for middle schoolers. WMS students got to work during FLEX today! They built 5 completed 16 foot garden boxes ready for soil and seeds. This is the only the beginning of what’s to come for Windsor Middle School’s “Farm to Table“ culinary program. WMS: Students, please come to an Informational Culinary Club Meeting TODAY in K113 during FLEX! Ms. LoCicero’s students are planting seeds and preparing for the Culinary class’s future garden. WMS: Just a reminder that school ends at 2:06 today and next week is Spring Break! Tomorrow is the Spartan Stampede! Last minute dye pack sales will take place between 8 and 8:30 am in the student store. Also, there will be no zero period. There will be no Coffee with the Principal or School Site Council on Tuesday, March 12th. Board Approves 2019-2020 School Year Start and End Dates. First Day for Students, Wednesday, August 14, 2019. Last Day for Students, Friday, May 29, 2020. More details to be published soon. WHS, WMS, and Brooks attending the Educating for Careers conference to help prepare for the launch of our new culinary program. WMS: STEAM Saturday is tomorrow for 5-8th grade students in the WMS Library. There will be permission slips at check in if you need one. Please consider attending to make up an absence to give $60 back to the schools to fund our programs. WMS: Permission slips for this Saturday's Attendance Make Up Day went home today. Attending Saturday will make up a previous missed day of school and provide $60 in funding to the school. Permission slips for the 8th grade WHS visit are going home today. The 8th grade trip is scheduled for February 14th. Permission slips for the next Moxies Yogurt field trip went home today for students who signed up. The next trip is available for purchase for 50 5Star points in the student store. Egg Drop Challenge winners are automatically added to the next trip. We are so proud of our connection with Windsor Arts Now to develop deeply integrated arts opportunities into the WMS curriculum. WMS is teamed up with Brooks and WHS to put on a conference for schools all over California on developing a model for 5th - 12th grade Career and Technical programs. WMS just completed our monthly emergency drill. Our Leadership class is gearing up to put on another great dance at WMS! Please review ticket info below as prices will go up. 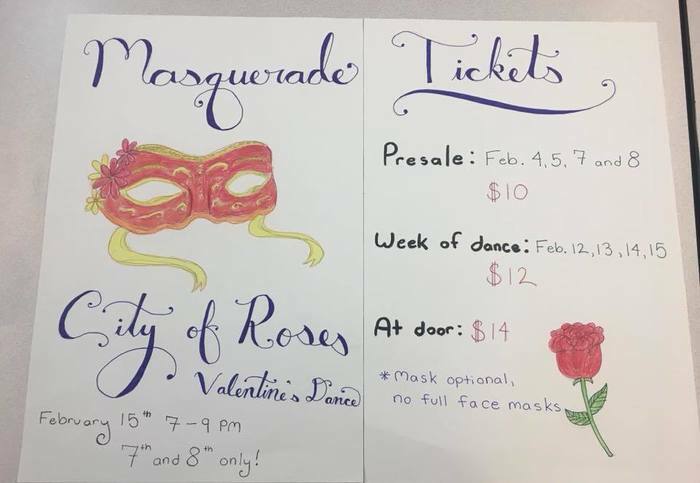 The student store will be selling tickets and masks starting February 4th. Congratulations to our WMS students that were selected to perform with the Sonoma County Honors Band. WMS: We had 80 students attend Saturday School recovering almost $5000 in attendance revenue! The last one for the year will be on February 23rd. WMS: 46 students have confirmed that they are attending Saturday School! That's $2760 back to our schools in made up attendance. It's not too late to come. We will have permission slips at the door. It's from 9-12. Our guidance counselor has been passing out elective forms for 2019-2020. We will be scheduling a parent information night in early February to go over the double elective process for next year as well as the elective descriptions. Permission slips for our Engineering Saturday are going out today. Wednesday, January 23rd, will be a B - Day schedule.